I believe that humans should be born at the age of 20, consigned at conception to hyperspace for two decades and then brought forth in all their glory. Nature, however, has decided that a complex developmental process is necessary before the adult stage is reached. Understanding adult personality is difficult enough for me, without having to deal with the added stress of child psychology. Children really are from another planet and play by different rules, or so it seems. The same can be said of stars. Stellar evolution, tracing the development of a main-sequence star through various stages of its life-cycle, is pretty well understood. Sophisticated numerical models (most of which seem to come from Italy) exist that allow one to plot the course of a star's life based on a handful of parameters, such as its mass and initial composition (basically the ratio of hydrogen to other elements). Stellar associations are young, loose groups of about 100 stars that share a common origin, move together through space, but are not gravitationally bound together (which is the case for open and globular clusters). OB associations are characterized by massive, short-lived, bright stars (spectral types O and B), with no trace remaining of the molecular cloud out of which they formed. T associations consist of stars not yet in the main-sequence phase of growth (pre-main sequence stars, PMS), found in the vicinity of the nebula out of which they formed. There are also R associations, groupings of young main-sequence stars that were not massive enough to disperse the nebula from which they formed; the nebulae can be seen in the reflected light from these stars. However, the formation of stars, out of dark, diffuse molecular clouds into bright celestial beacons, is not yet well understood, and many uncertainties remain. It may be, for example, that there are significant differences between stellar formation in our Galaxy compared to other galaxies. Recent studies of star formation in the Large Magellanic Cloud seem to suggest this. There is also evidence that the star formation process differs significantly for low-mass and high-mass stars. In the 1980s, it was thought that high-mass and low-mass stars formed in different environments; the former in OB associations, the latter in T associations (footnote 1). Then in the early 1990s, many low-mass pre-main sequence (PMS) stars were discovered in OB associations. This discovery was made possible with the advent of space-borne observatories, like ROSAT, carrying telescopes capable of seeing in the x-ray portion of the spectrum. PMS stars, which are still in the early stages of their evolution, rotate rapidly and have strong magnetic fields, which give rise to powerful x-ray emissions. By the late 1990s, evidence began to accumulate that groups of these PMS stars also formed around single high-mass stars. Examples include sigma Orionis, eta Chamaeleontis, gamma-2 Velorum and beta Crucis. Beta Crucis (or Mimosa, the brightest star along the short arm of the Southern Cross, nearest the Pointers) is an extremely luminous blue-white giant star, similar to Spica in Virgo. It is also a bright x-ray source, and was recently observed by a team of North American researchers using the orbiting Chandra X-Ray Observatory. From the spectrum obtained, they hoped to learn how the x-rays are generated. They were in for a surprise. "We are interested in how the highly supersonic stellar winds of hot, luminous stars produce x-rays," said team leader Prof. David Cohen (Swarthmore College, USA). Examining the x-ray spectra of beta Crucis, Cohen and his team found not one, but two, strong x-ray signals. This serendipitous discovery of a second source suggests that beta Crucis may actually be a double star. The x-ray properties of the companion are consistent with it being a low-mass PMS star, said co-investigator Prof. Eric Jensen, also of Swarthmore College. "Its x-ray emission is relatively high-energy and it shows a significant degree of time-variability in its overall x-ray emission levels, as we would expect from a young, low-mass star", he noted. Although both stars are presumably the same age (about 10 million years), beta Crucis is already middle-aged, while the companion is very young. This apparent contradiction is resolved when one takes into account the initial properties of the two stars. As with people, "live fast, die young" is the rule. Beta Crucis is a high-mass star, so it is luminous and evolves rapidly, having already used up much of its nuclear fuel. The companion, because of its low-mass, has developed sedately and hasn't even begun to burn its nuclear fuel yet. Beta Crucis as a double star, part I. The new Chandra observations reveal that the companion is located 4 arcseconds south-east of beta Crucis. Of course, just because two stars appear next to each other in the sky does not mean they are close together in space – they could just coincidentally be in the same line of sight. "Follow up observations will be required to verify that the two stars are actually gravitationally bound (i.e. orbiting each other)," Cohen writes, adding that "if they are indeed gravitationally bound, then the companion orbits beta Crucis with a period of about 2000 years. Measurements with optical and/or infrared telescopes [of the companion would verify] that it really is a low-mass pre-main-sequence star." distance (in light years) = distance (in parsec) x 3.2616.
where d is the distance (in parsecs). Beta Crucis and the companion will be at the same distance from Earth (give or take a split hair). How far away is beta? A good source of current information on objects outside the solar system is the Simbad astronomical database, which is a gateway to thousands of astronomical catalogues and data sets. Looking up beta Crucis in Simbad resulted in the entry for this star in the Hipparcos catalogue, where the star's parallax is given as 9.25 milliarcseconds, which translates to a distance of 353 light years, or 108 parsecs (see footnote 2). From theoretical arguments, using stellar evolution models, pre-main sequence stars have an absolute magnitude M of about +6 or +7. Plugging these values into the equation allows us to work out the apparent magnitude, m.
"My best guess is that the V magnitude of this x-ray discovered companion is about 11." 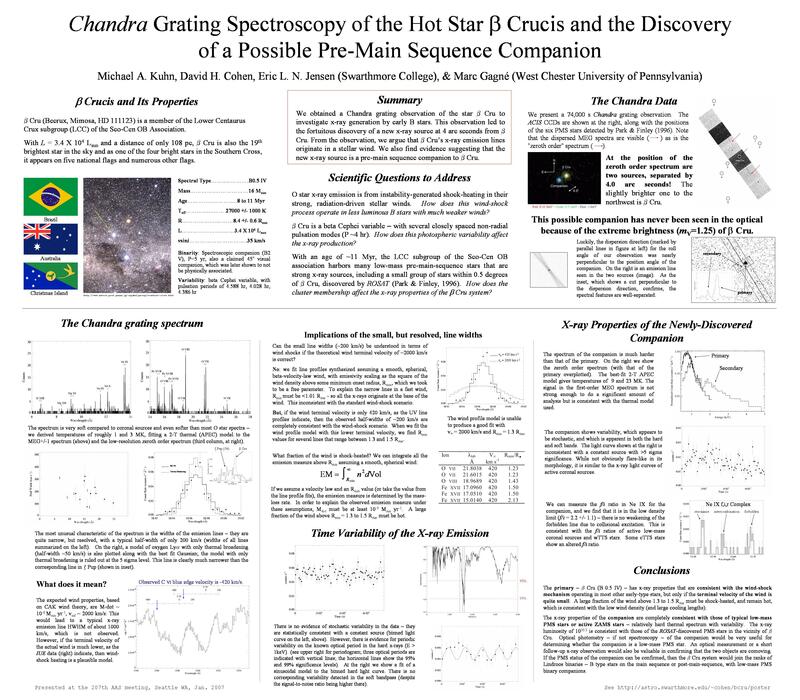 "About ten years ago, the ROSAT x-ray telescope (with worse spatial resolution than Chandra, hence without the ability to detect this new companion) discovered six x-ray bright, low-mass pre-main-sequence stars in the vicinity of beta Crucis. (Follow up optical spectroscopy confirmed that most of them were, indeed, low-mass pre-main-sequence stars.) These stars range in magnitude from 9th to 13th. I strongly suspect that the companion we've discovered is part of this same population, so depending on its mass and thus spectral type, it should have a V magnitude in that range." "It's interesting – all the optical observers I talk to initially think that detecting this thing optically (or more likely in the infrared) should be easy, because of the relatively large separation, but when they look into the technical details, it becomes apparent that it's quite difficult (though probably doable with some combination of adaptive optics, space-based observing, and a coronograph). Sirius A+B is an obvious analogy, but the (maximum) separation of the components there is about twice as great as for Mimosa." So there's a challenge to the observers – who will be first to see or photograph Mimosa's tiny new companion? Beta Crucis as a double star, part II. Besides the newly discovered star, beta Crucis has at least two other candidate companion stars. In the language of double-star observers, the primary star is labelled "A", and the companions "B", "C" and so on. Usually the companion's letters are assigned in order of position, but some observers assign the letters in order of brightness. It's not only the computer industry which lacks standards, it seems. Also marked in the images is the delightful variable star DY Crucis. Classified as a carbon star, in visible light it shines at about 9th magnitude, but when seen through a blue filter, it "shines" at magnitude 14.7. Dim in blue, it is brilliant in red. Through binoculars, but even better in a telescope, it appears blood-red, contrasting beautifully with the dazzling blue-white beta nearby. The first companion, designated "beta Crucis C", was discovered by fellow deepsky observer James Dunlop from Paramatta, New South Wales, Australia, in 1826. He noticed a 7.5 magnitude star 6.4 arcminutes north-east of Mimosa and logged it as Dun 125. Another fellow, John Herschel, measured it in 1853 from Cape Town and found essentially the same distance and direction. The Washington Double Star Catalogue (WDS) includes a measurement made in 1991, confirming the earlier results, showing that the two stars haven't changed their position relative to each other for 150 years (within the accuracy of the measurements). Careful measurements of the proper motions of these two stars suggest that they are not related. The HIPPARCOS satellite determined that Mimosa ("beta Crucis A") drifts westward in RA 48 milliarcseconds each year (mas/yr), and southward by 13 mag/yr. In comparison, the C-component moves eastward 8 mas/yr and southward by 16 mas/yr. This suggests that their real motion through space is not compatible, and that they appear near each other by chance. Andrew James of Australia points out that beta Crucis B, although measured by R.T.A. Innes in 1910, was probably known to him much earlier, perhaps as early as 1894 when Innes was in Australia. A much fainter companion, "B", was first measured in 1910 from Cape Town by R.T.A. Innes, probably using the 7-inch Merz refractor. Catalogued as I 362, Innes recorded it as being 44.3 arcseconds from Mimosa. The most recent measurement available in the WDS essentially confirms this (42.6 arcseconds distant). As luck would have it, beta Crucis B has a visual magnitude of 11.4, similar to the brightness of the new companion. The image below, extracted from the Digitized Sky Survey, shows this star and the new companion. Feigelson, E.D. & Lawson, W.A. (1996) On "A new stellar nursery in the Southern Cross", AJ, 113(6), 2130-2133.